Monday November 12, 2018: Abigail throws Chad off when she goes into labor, Tripp is questioned in the arson case, and Stefan demands Gabi tell him the truth about gaslighting Abigail. At Doug’s Place, Ciara’s shocked when Ben reveals he has feelings for her. She gives a half smile. He tells her it’s been building since the cabin and he felt a connection to her that he’s never felt with anyone. She agrees they had a connection, which is why she defended him. Why didn’t he say something sooner? Ben was denying his feelings which took him by surprise. He asks if she feels the same. “I’m in love with Tripp,” she reminds him. Ben respects that. He wonders if she started dating Tripp because he was no longer an option. Ciara’s offended but Ben says the timing is no coincidence. Ciara says she and Tripp had a history before Ben. Ben reminds her it wasn’t all good. Ciara feels it was a mistake to confide in him. Ben apologizes. He just wanted to be honest but knows she’s now in an awkward position. He’s not even sure he’s capable of love. Ciara knows that’s not true. Someday someone will return that love. Hope and Rafe meet Tripp at the square on official business. Claire pokes her head in and questions what’s happening. Tripp allows her to stick around as they inquire about purchasing a can of accelerant at Brookeville Hardware. Claire says Ben must have bought it but Rafe informs her that the owner says it wasn’t. Tripp denies it, even when Hope asks if the shop owner could ID him. They go and Tripp wonders if he should have confessed. Claire comes up with an idea. Tripp thinks it’s a lot to ask and reminds her he’s in love with Ciara. Claire is doing it as a friend. She makes a call. 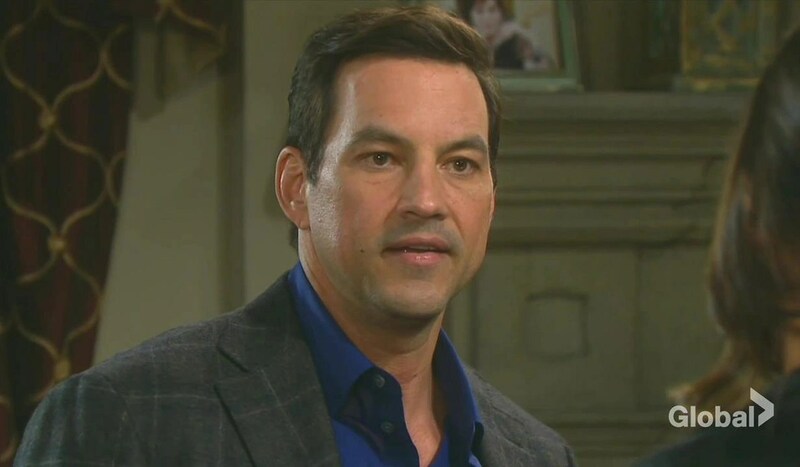 JJ arrives home and Jenn tells him that Stefan’s claiming that Chad kidnapped Abigail. She’s worried but JJ hopes this will bring them closer together. Stefan finds Gabi at his mansion. She claims she came to talk Abs out of marrying him. Stefan singsongs, “You’re lying.” He wants the truth or the police will get it out of her. She admits she came to stop Chad from kidnapping Abigail. Stefan calls it too late. It’s done and reported to the police. Stefan asks if Gabi’s framing her. Gabi deflects and Stefan points out that Gabigail hasn’t made an appearance since Abby married him. He asks to see what’s in Gabi’s handbag, since she’s holding it so tightly. She lies about what’s inside and Stefan grabs it and pulls out the Gabby wig. He wants answers. Gabi lies that she found it there. Stefan yells that she made this up and figures the attack never happened. “Kate saw it happened,” Gabi yells back. Stefan scoffs at that since Kate’s a big liar. He looks in the bag and finds sedatives and screams at her. He now has proof that she’s been gaslighting Abigail all along. Gabi tries to deny it but is forced to admit it’s true. Stefan hollers about putting Abigail and his baby in danger. He realizes Gabby’s not back and Gabi reveals she is the one who texted him and grins that she was able to get revenge on him and Abigail. Stefan wonders why Kate would help her. Gabi shrugs. At a cabin on Smith Island, Abigail goes into labor. Chad has a fit. She’s not due yet and he rambles as she starts deep breathing. Abigail’s water breaks and Chad’s voice gets higher, the more stressed he feels. He tries to get her to stop the labor and says, “Stop doing it.” Abby pants that this isn’t her fault, and clutches his hand hard enough that he calls out. Chad tries to get a signal, thinking the paramedics can jump on the next ferry, but he can’t get a signal, though he tries, getting up on furniture and waving his phone around. Abby tries to calm him and talk him into delivering the baby. He stammers up a storm and goes into a loop, repeating, “I can do it. I can do it.” He calms down and they profess their love for each other. He tries to distract her by asking her to tell him the story of how her mom gave birth to her in a cabin and she starts pushing. The baby is soon born. It’s a girl. Chad cleans her up and they snuggle her and cry together. JJ and Jenn arrive at SPD. Rafe and Hope tell them there’s no evidence and Rafe knows Abs is in no danger. Rafe’s stunned to learn that Abigail is accusing Gabi of gaslighting her. Everyone files out and upset, Rafe calls his sister, and leaves a voicemail to call. Later, Hope and Rafe receive Wyatt (played by Scott Shilstone) who confesses to have framed Ben Weston. Jenn and JJ go home and call Laura, who hasn’t been able to reach Chad since he called earlier. Paul’s tempted to read something private.